Business Traveller’s features editor Felicity Cousins and online editor Mark Caswell are taking part in the Mayfair Park and Tower Race on June 17, a race up the 475 steps of the Hilton on Park Lane in support of apprenticeship charity Galvin’s Chance. 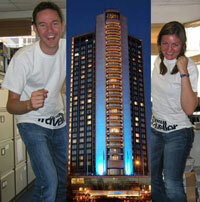 The race comprises of a run around Hyde Park followed by a “sprint” up the 28 floors of the Hilton on Park Lane. We will be raising funds for Galvin’s Chance, a charity offering apprenticeships for disadvantaged young people aged between 18-24, at some of London’s finest hotels. The charity is an initiative created by the Hilton In the Community Foundation. For more information or to make a donation to the charity, please visit justgiving.com/businesstraveller2009.